A couple of weeks ago, I made a kitchen table and chairs for an old friend. Her daughter somehow got it into her head that I make tables all the time, and so asked me to make a couple of small tables for her. She had an idea of what she wanted, so I drew a quick few sketches, and here is what we came up with. 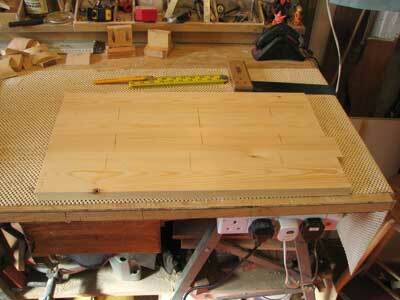 Firstly I cut the boards for the table tops. For this I used 100 x 25mm P.A.R. redwood and cut this to size on the mitre saw. I then laid them out on the bench and marked them off for doweling together, and to do this I used my Beadlock jig from Trend. 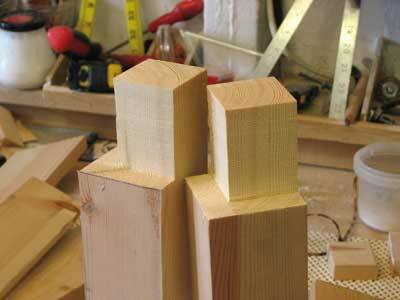 It's made for making loose tenon joints, but I find it doubles up nicely as a dowel jig. 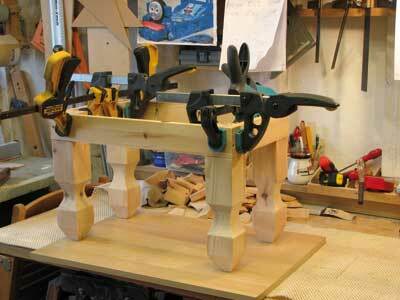 When the top was glued and clamped together, I went on to make the legs. These were made from 75 x 75mm. 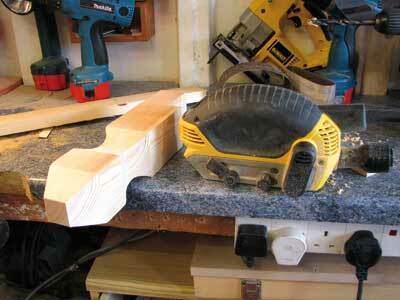 To give the legs some shape I decided to cut out curves all round, and after marking them out I went to my bandsaw. 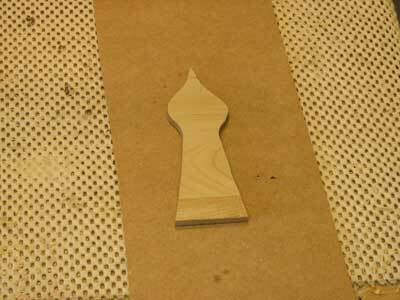 Mine is only a small bench-top bandsaw, and these cuts were almost at its limit; I just had to be careful to get all the corners spot on. 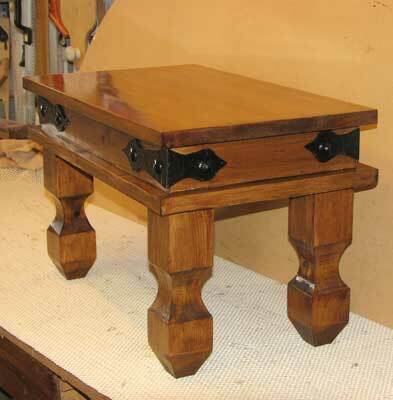 The next job was to cut the chamfers on the bottom of the legs. This again was done on the band saw: I set the Mitre gauge to the chosen angle - in this case 37 degrees - to give me an 8 degree chamfer on the bottom. 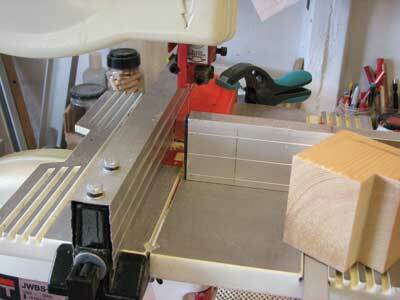 I marked the desired height of chamfer and clamped a stop block to the mitre gauge to make the cuts. 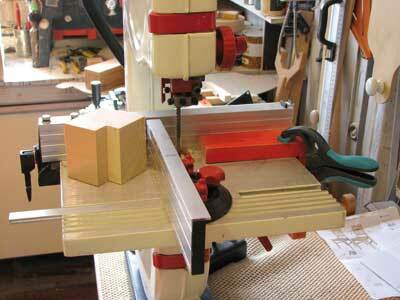 The stop block ensures all 16 corners are exactly in line. 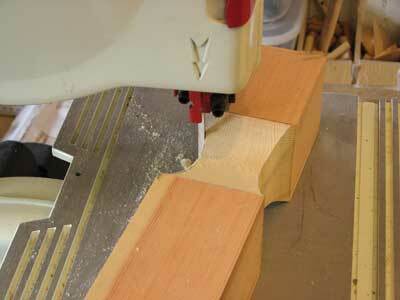 When I was happy with the height of the table, I cut the legs to size on the mitre saw to ensure all are dead square. 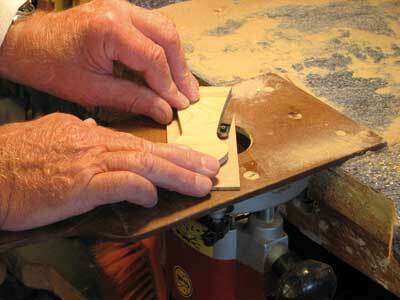 Again, against a stop, all are cut to exactly the same length. Next I needed to make the cuts in the legs to accept the table aprons, so I cut a test piece to make sure it was accurate. Again, setting the stop blocks cut the corners from all four legs: you can cut all the legs the same, as they are interchangeable. 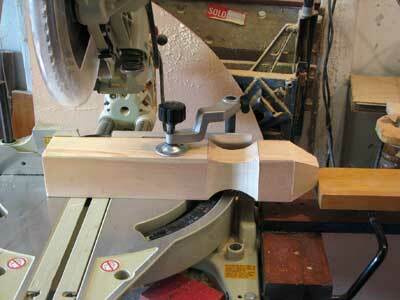 I sanded out the curves on the legs with a fine belt, and with the grain I got an excellent finish. 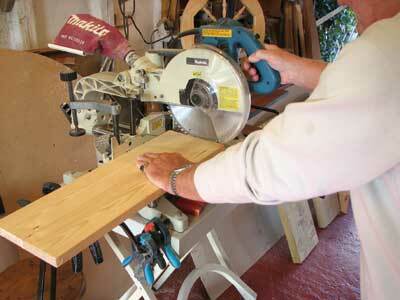 Compact belt sanders are invaluable for this kind of job, and are definitely worth your money. 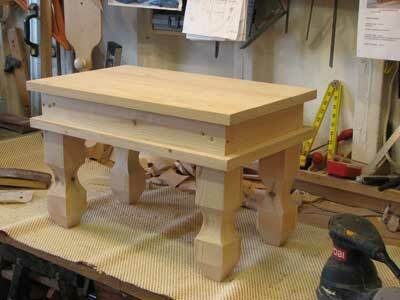 Next I made up a frame to form the table apron, then used mitred joints on the corners. 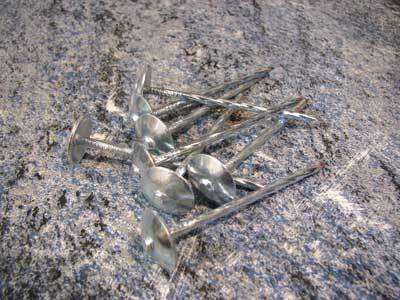 You can use glue and screws on the legs as the latter won't show when finished. While the glue was curing I made a template for the mock corner braces. The template is made from flooring laminate: I always seem to have some left from past jobs, and it's great stuff for making jigs and templates. 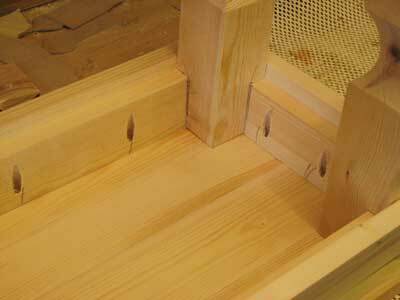 The mock corner braces were made from 1mm M.D.F. My first deliberate mistake was to make the braces all the same length, until it dawned on me that the table is rectangular and so needed shorter braces on the ends of the table. 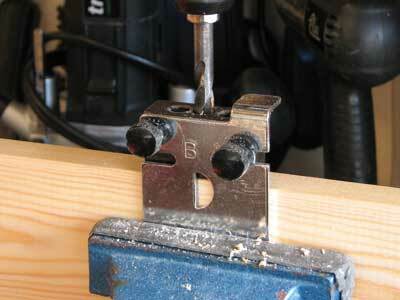 Drill the holes for the pocket hole joint on the table apron before fixing it to the legs. 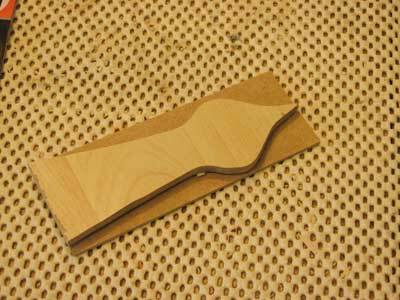 Making the braces is dead easy: cut the blanks, and with double-sided tape stick the template on a blank. 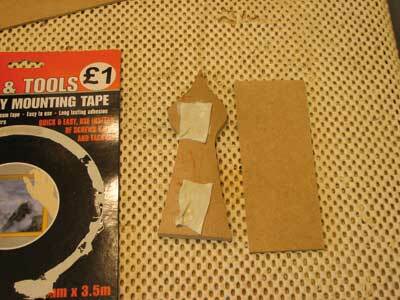 The tape can be picked up very cheaply and comes in handy for all kinds of jobs. 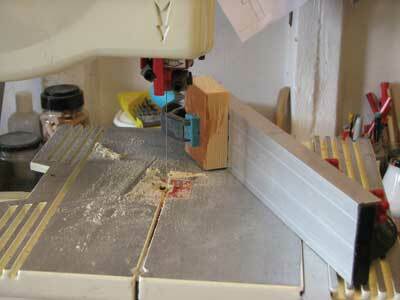 With a profile cutter in the router make your passes; for this I used my router sub base screwed to the bench. Around the bottom edge of the table apron I glued on a 25 x 25mm strip: this now gives you the finished size of the table top to be in line with the strip glued onto the apron. 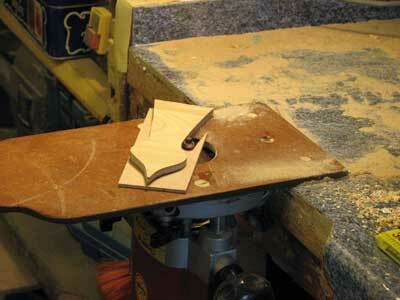 Now, sand the top well and cut it to size so the top overhang is equal to the 25mm strip on the bottom of the apron. 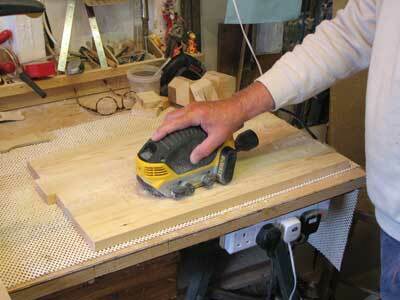 Use the pocket holes to screw the table top to the frame. Now you are ready to apply the finish, in this case three coats of Johnstones walnut varnish stain. To paint the corner braces I used Black Hammerite, to give it an antique look. Pour a small amount into a plastic top and leave overnight with the top uncovered: the Hammerite will thicken up and cannot be painted smooth, so don't even try, as it will give a textured look which looks quite effective. For the studs in the corner braces, they are nothing exotic: just spring head nails used for roofing, and with the shank cut down and ground to a point. When I tapped them into the pilot hole in the braces, it left the top of the nail exposed. I personally thought it looked okay, so I left it as it was. 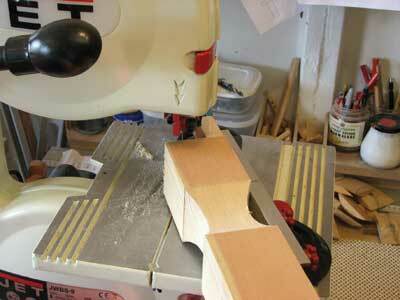 The braces were first glued on with hot melt glue. Sand the end grain of the table top thoroughly: the better the polish on the wood the better the match of the stain for colour with the rest of the table. 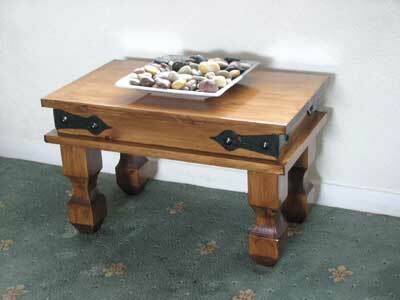 "The better the polish on the wood the better the match of the stain for colour with the rest of the table"